NOTE: Much of the content for this blog has shifted to the Ultimate Direction Blog. There you will find Trip Reports and essays from Anton Krupicka, Peter Bakwin, and occasionally myself and Scott Jurek. 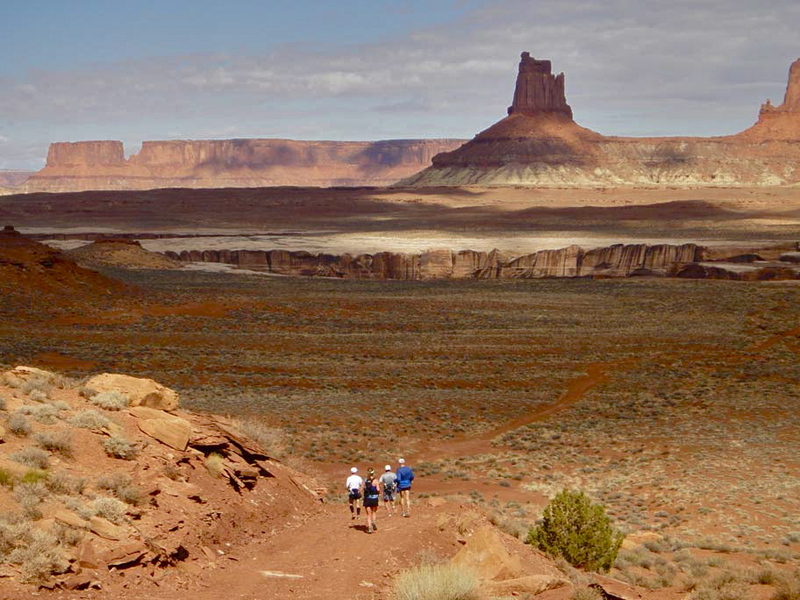 Below is an exception – this Adventure Running Blog has featured excellent info on The Maze, and this report adds more. April 11-14, 2013. 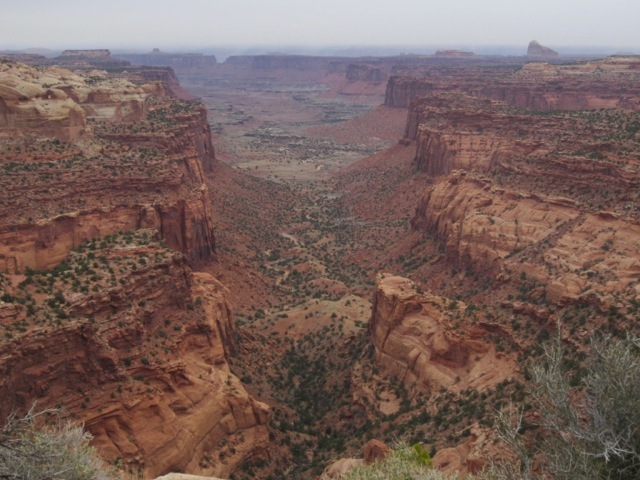 Canyonlands NP and Robbers Roost, Utah. 107 miles, 4 days. Backpacking – Peter Bakwin and Buzz Burrell. The Maze is one of my favorite places in the world. “So near yet so far” – it’s in the middle of Utah, yet is probably the most remote spot in the lower 48. Not much water and tricky navigation mean it’s expert-only terrain, but the rewards are obvious: beautiful scenery, usually excellent weather, and extraordinary solitude: we saw mostly footprints in 107 miles covered over 4 days. I’d been here many times, but always alone; this time I met my frequent partner-extrodinaire, Peter Bakwin, for a route that combined the Maze Loop with another loop through the even more remote Robbers Roost country, hiking the length of Happy Canyon (thus the name of this route), and exiting up through Sams Mesa Box Canyon to close the loop. I’m expanding my definition of an “adventure run”. No longer does it have to include risking one’s life; now it can just be really fun, interesting, or new. Such was the case a few weeks ago. 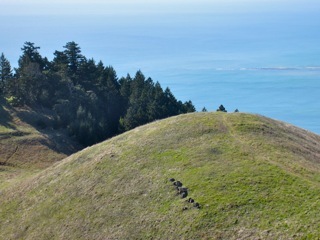 I was in the Bay Area visiting Galen and Kristin, spectating the amazing North Face 50, and really enjoying the weather. While a massive high pressure cell was pounding my home on the Front Range with near-zero temps, wind, and snow, the same system provided NoCal with unprecedented warmth and absolutely clear skies. G & K live in Mill Valley, right on the east flank of Mt Tam. So on Monday out their front door I went, looking for a very easy but full day of exploring the beautiful and unique terrain of the Marin Headlands. I felt like Davy Crockett. The Trans Zion – a wonderful run that traverses Zion National Park from one end to the other – was getting too crowded. Once an uncommon adventure, it seemed like someone was now doing it every spring weekend. So in May when Jared Campbell shoots me an email with a Google Earth file attached and the entire text of the message is “Call me. :)” … well, I examined the file then called immediately. Turns out he had devised a new route thru Zion National Park, a very clever one going from west to east over the best summits, thru the best canyons, crossing some unknown territory, and with minimal time on actual trails. The Google Earth file showed a technical route climbing up to and then descending Icebox Canyon, running up the Hop Valley Trail to Wildcat TH, climbing the two Guardian Angels, then launching across unknown terrain hoping to connect with the West Rim Trail. From there the idea was to descend Imlay Canyon to the Narrows, then complete the Traverse by scrambling up Orderville Canyon. I loaded my Utah Topo! DVD, carefully studied the contours, and was somewhat surprised: this route actually seemed possible. This looked great. NOTE: This blog has always focussed on descriptions of great adventure trail runs, providing uniquely excellent information intended for the accomplished runner / reader. I’m going to broaden the scope of this blog. Prompted by the topic below, which somehow caught and held my attention, there will be more essays, equipment tips, and news. 1) Greg Mortensen is justly famous for his book, “3 Cups of Tea” (released in 2006 and selling 3 million copies) followed up by “Stones Into Schools …”. He founded the Central Asia Institute which receives donations to build schools for children in Pakistan and Afghanistan, and which during December 2010 alone, raised $8 mil. He’s famous, he’s won many awards, he’s idolized, and his book was even required reading by US Army in Afghanistan. New Trail Race in Boulder! Boulder, Colorado – Boulder Trail Runners is pleased to announce the creation of a new trail race to be held in Boulder’s Open Space and Mountain Parks. Long thought to be totally impossible due to extremely restrictive regulations, the news was welcomed with surprise and delight by members of the running fraternity. Entry into the inaugural Goshawk 50, named after a bird that doesn’t live here, but theoretically could, is typical of many ultra’s in the country nowadays. You can’t get in unless you sleep with the Race Director. The White Rim was in great shape: the Mineral Bottom road, which has been closed due to a huge flood back in August, wouldn’t open again for two more days, which means we ran this entire 25 mile loop with not only zero jeeps passing us, but not seeing a single other person. Cone Peak "Sea to Sky"